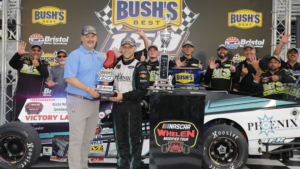 Justin Bonsignore's dominant 2018 season on the NASCAR Whelen Modified Tour continued on Thursday at Bristol Motor Speedway, and he added an important first in the process. 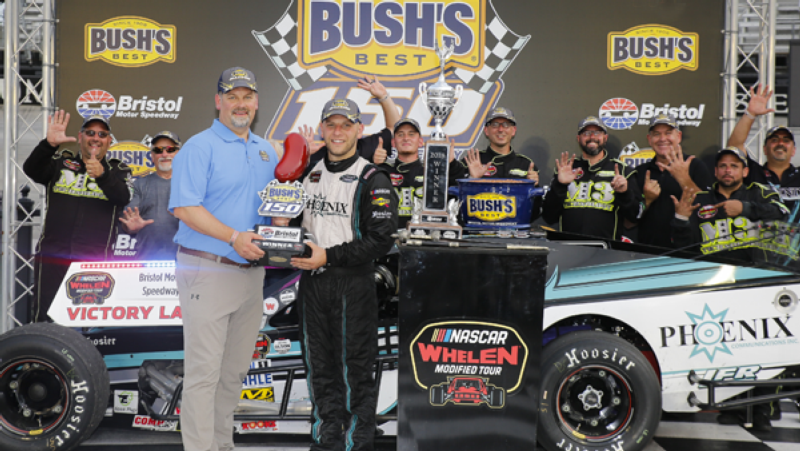 Bonsignore had never enjoyed the ultimate success in Bristol but all of that changed at the Bush's Beans 150, as he led the final 60 laps to earn his sixth win in 11 races this season. Just as important, Bonsignore claimed his first career win at Bristol in the No. 51 Phoenix Communications Inc. Chevrolet, something that will stick with him for a long time. "This is huge for our team," Bonsignore said. "We've been coming here since 2010 and we've always had a lot of speed and a lot of success, but the last couple years it's been either feast or famine. We've either been leaving here with a good finish or a destroyed race car. We wanted to win Bristol. It's a huge thing to check off the list as a modified guy, and I'm really glad we were able to do it." Bonsignore led for 69 laps overall, holding off numerous charges from Chase Dowling down the stretch. They provided an entertaining duel for the last portion of the race, but Dowling, who finished second, could never find his way around Bonsignore, who has closed races almost perfectly in 2018. At Bristol, Bonsignore kept Dowling guessing with a strategy he worked to perfection, especially in the latter portion of the race. "Chase was able to stay right with us, but I kept moving my line around, go to the top, go to the bottom, just take any momentum away that he was getting," Bonsignore said. "I was just able to get a good, consistent run on the bottom the last 10 laps." Rob Summers finished third, while Patrick Emerling, who led the first 52 laps, took fourth. Emerling was impressive right off the bat and was in control for the first portion of the race before Bonsignore passed him on lap 53. Emerling spun out three laps later as his car got away from him, and Bonsignore soon took control. He initially struggled out of a restart on lap 61, with Timmy Solomito grabbing the lead for 28 laps, but Bonsignore jumped back in the lead at lap 90 and never relinquished it. Even with the lead, Bonsignore stayed aggressive, getting the ultimate reward with hisfirst Bristol win. "It was a really good race," Bonsignore said. "After 20-30 laps, the outside came in. From there, I really knew how good our car was. It just wouldn't go on restarts for some reason, but after a couple of laps our car was really, really good." Dowling had a couple of strong charges, including an entertaining battle on lap 119, as it was a two-driver show down the stretch. "We're bringing pretty fast race cars to the track every week and we're pretty much a top-five car, I feel, and we have pretty good speed," Dowling said. "We're running good. We've finished second a lot and the 51 has been pretty dominant all year. But I'm confident we'll get one soon." Summers was elated with his third-place finish, hopeful it provides the spark his season needed. Racing well at Bristol only added to the good vibes his team was feeling after the race. "This was big for our team," Summers said. "We needed something like this really bad. We've had a fast car all year, so we needed that type of race bad. It was a great day for us and a big morale boost for our team. It's just a blast to race here and to finish third, it's a good day for all of us." Nobody, though, had a better day than Bonsignore, who shrugged off his early struggles on restarts on Thursday to put together a pair of impressive restarts over the final 65 laps. Bonsignore also showed one more time how far his team has come in 2018 after struggling mightily a year ago. Now, he's on the cusp of a championship with a victory at Bristol also in his pocket. "We put the right people in place over the winter," Bonsignore said. "I think everybody is really happy with how things have turned out. Last year really humbled me. We went from almost winning the title in 2016 and just fell flat on our face (in 2017). That will humble you quick, so we're not taking any of this for granted right now. We're living in the moment and we just want to win races."